Have you been wanting to host a romantic dinner at home for your spouse? My husband and I are super busy, so it appears the only time we can spend time together is when I plan a romantic dinner at home. One of our favorite meals to make is this Gluten Free Cast Iron Skillet Baked Spaghetti dish. Simple, yet super delicious.These dinners at home are used to help us spend time together and to get to know each other even better, after all of these years. When planning a romantic dinner at home, the main meal is most important. When I am planning a romantic dinner at home with my husband, I often have Barilla® Gluten Free Pasta on hand. You can find this brand at your local neighborhood Kroger store. The right pasta can really help me create the best meal possible. One of my favorite meals to make my husband is this Gluten Free Cast Iron Skillet Baked Spaghetti dish. Simple, yet super delicious. Whether you have been married 10 years or 10 days, there is just something about being surprised. When planning that romantic dinner at home, surprise your spouse, they will love it. I know it can be hard to keep something like that on the down low, but it makes the dinner at home so much sweeter. What kind of drinks will you have for your romantic dinner? Sparkling water or grape juice are both excellent choices. You can serve water if you want, but just plan on something. You will need something to help wash down the delicious meal you’re going to make for the romantic dinner. I love how I still giddy about planning a surprise dinner with my husband, even after all these years. One thing I learned about pulling off a romantic dinner at home is to have fun with it. Whether you dress up or wear your pajamas, your spouse will be happy because they are spending time with you. So, enjoy yourself and have fun with this romantic dinner at home. Barilla® Gluten Free Pasta is my go-to ingredient for all of my pasta recipes. My family and I try to eat gluten-free as much as possible without sacrificing quality taste. Barilla is a brand we trust. If gluten-free is not your thing, that’s okay too. Barilla® offers a variety of selections to choose from. Go HERE for more Barilla Pasta Recipe Inspirations. Let me know in the comments below which delicious “Wonderful Your Way” recipe you plan to try! Find a recipe that you both would love to make together in the kitchen. Wear your favorite dress or tie. Dress up like you are going out for a nice dinner in a restaurant. Watch a movie and eat your yummy dinner together. Play board games together, while eating your favorite dinner. After dinner, turn on some great dancing music and test your dancing skills. You might surprise yourself! Such a great take on baked spaghetti! I am definitely going to try this one. I’ve never made spaghetti in a skillet. It looks good! This looks delicious. I’m sure my family would love it. Thanks for posting! I just asked for a new LARGE cast iron skillet for Christmas…and will be using it this weekend. Love cooking this way, and your recipe sounds delicious. Your baked spaghetti dish looks delicious, something new for me to try. I love your tips for a fun date night, thanks for sharing. My kids are a big fan of pasta and spaghetti. I should make this for them. Yummy. 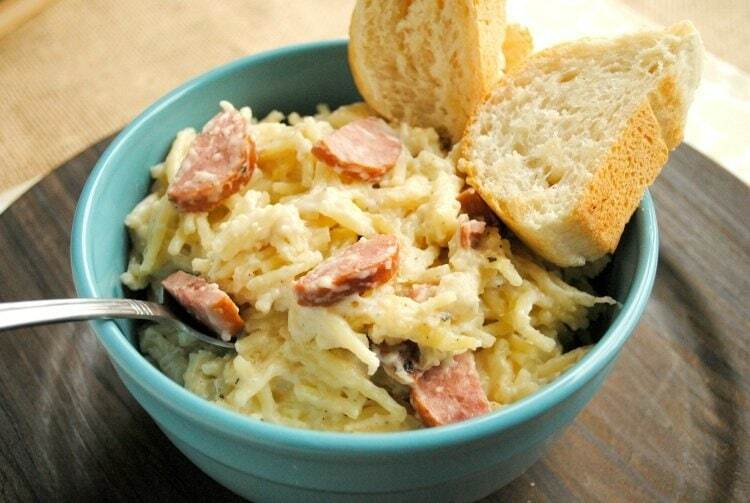 This is perfect for a date night meal. It looks absolutely delicious! I’ve never tried Gluten free spaghetti, I think I definitely will! It sounds like a really delicious pasta dish and i love your ideas for date night at home. My husband loves board games so he’d love this pasta dish alongside his favourite game! I have a beautiful skillet that I never seem to use! That’s going to change now! Looks like a great dish! My son would love this! Its Barrilla or nothing in our house! There really is something romantic about Italian food, isn’t there? This is such a wonderful meal for date night & I bet your hubby is wishing that date night was every night if this beauty is the main event. WOW!! Gluten free too?! Yum! I will have to try this recipe!! I love cooking with my cast iron skillet! It is so versatile in the ways in which it can be used to cook or bake!! I love skillet dishes and I just got a new larger one for Christmas! This sounds super delicious! This looks so yummy, I’m definitely trying it. 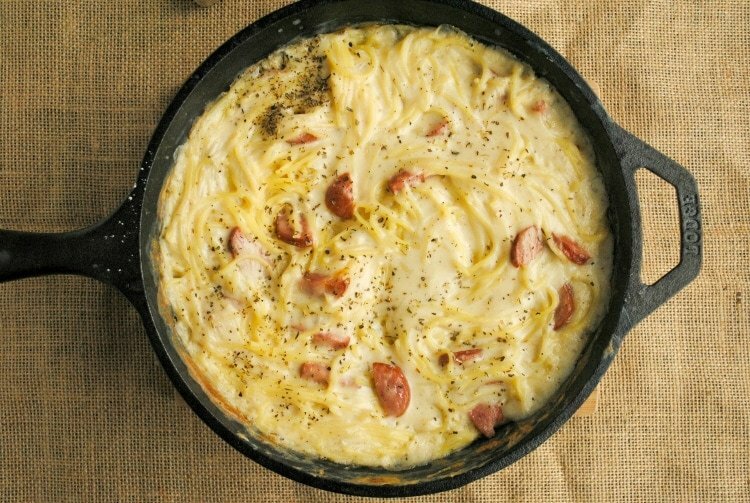 I would like to make the 5 Ingredient Creamy One Pan Pasta. This is a perfect meal for my family. Thanks for the recipe! Can’t wait to try this receipe! Looks delicious and my son would LOVE this recipe! Absolutely going to have to try this week. I love Cast Iron Cooking! It is so much fun and this recipe is so delicious and I want to make it for the family! We would love it. Looks yummy I am definitely going to give it a try. I have not tried cast iron cooking, but will definitely try now, looks delicious. 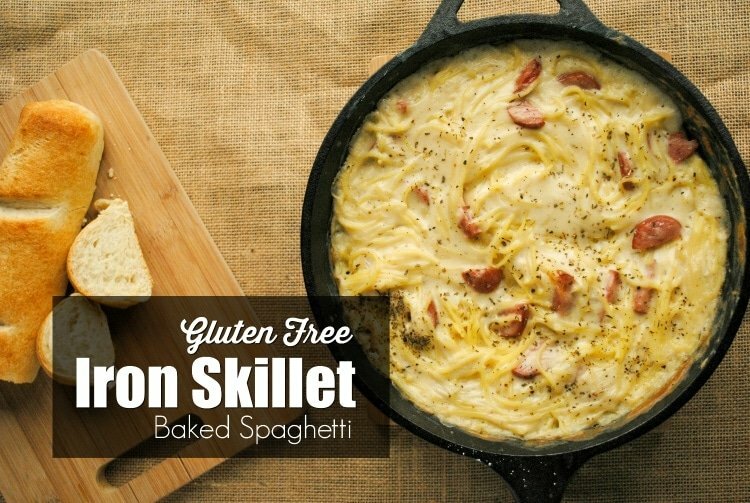 I have never had skillet spaghetti but I am going to try this for sure. We use only Barilla Pasta never try Gluten free nd nvr cooked on cast Iron I will givee it try hope will not be over cooked. 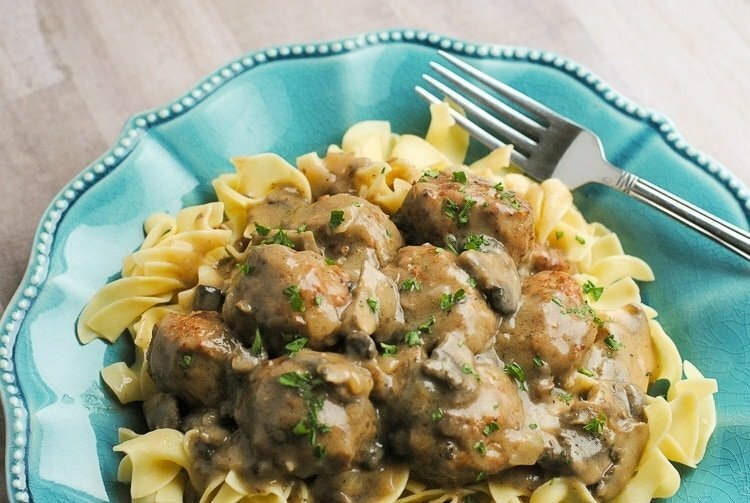 Looks good and a quick and easy midweek dinner. Spaghetti is such a versatile dish. Looks amazing! Thanks for the recipe!